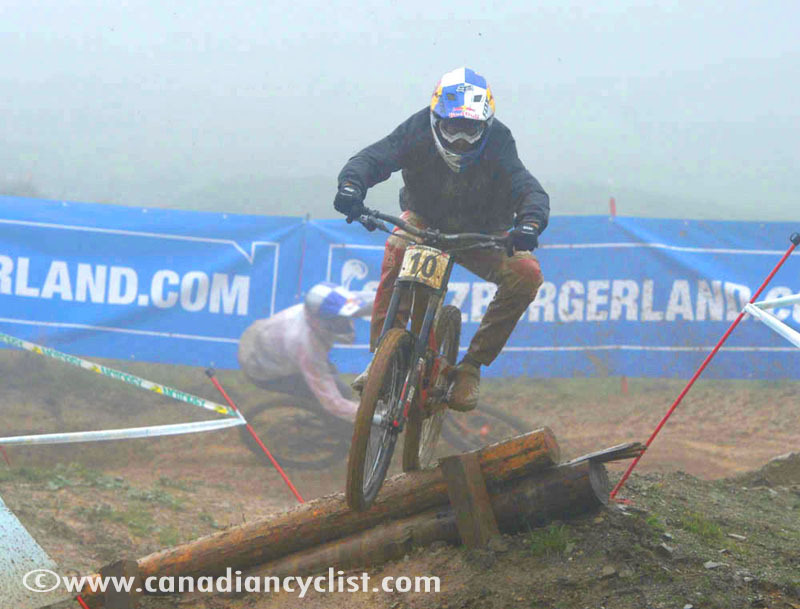 Ten years after the UCI Mountain Bike World Championships took place in Kaprun, Austria, the event has returned to the same region for the 2012 edition, to take place in Leogang for the Gravity events and Saalfelden for the Cross-country. The region holds strong memories for Canada; Roland Green won the second of his two men's cross-country world titles in Kaprun, and Canada also took the Team Relay title in Kaprun, with Geoff Kabush the only rider on that team to be racing at the 2012 Worlds. Alison Sydor has retired, Ryder Hesjedal, of course, went to the Road and Max Plaxton (the Junior on the team), is missing these championships due to injury. 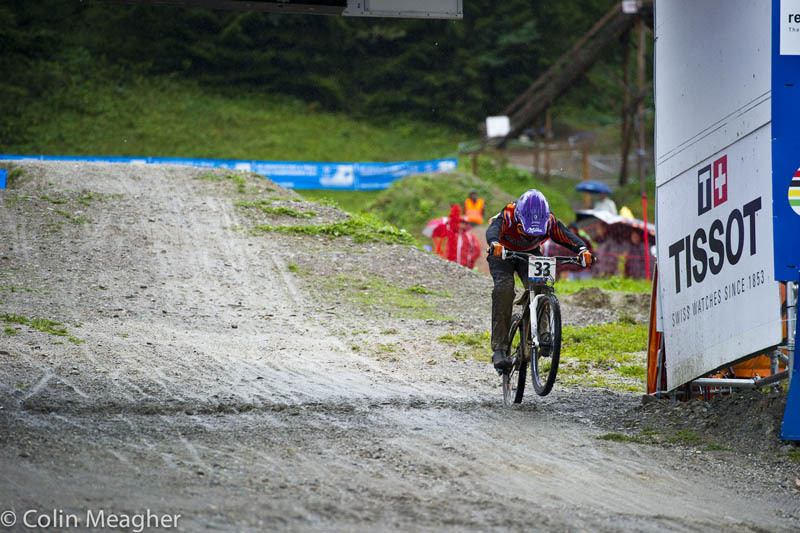 The Worlds begin this weekend in Leogang with the Gravity events - the 4-cross and Downhill. Unlike previous years, when both Gravity and Cross-country competition takes place at the same venue over a five day period, organizers here proposed and received permission to split the championships over two weekends, in two nearby communities, with the Cross-country events scheduled for next weekend in Saalfelden. The village of Leogang is well known for the World Cup it has hosted over the past few years. The competition begins with the 4-Cross Qualifying on Friday evening and the Championship Finals on Saturday evening, and then followed by the Downhill Final on Sunday. The 450 metre 4-cross course was designed by German pro Guido Tschugg for the World Cup series and has been updated, while still retaining many of the features that have made it so exciting. Out of the start the riders hit a sharp left and then right turn before negotiating the rock garden and then a third banked turn. From there, they jump a bridge and negotiate a washboard section before a final right turn and jump into the finishing straight. The women's field is headed by Anneke Beerten (Netherlands), the defending world champion, who qualified first, just ahead of Romana Labounkova (Czech republic). Others to watch for include American Melissa Buhl, the 2008 world champion, and local Austrian favourite Anita Molcik, who will certainly step up her game in front of the home crowd. On the men's side, there is likely to be a battle between the three Czech riders - Michal Prokop, Tomas Slavik and Lukas Mechura - however, David Graf (Switzerland) has regularly made the podium and will certainly be a factor, after qualifying first, just in front of Slavik and Prokop. The 2600 metre Downhill run will favour riders with fitness and endurance. The very fast course has a 'Bike Park' feel to it, and requires riders to pedal hard to maintain speed all the way down, especially on the opening half of the run. Friday's training saw heavy rain, which has chewed up the corners somewhat and made the track more technical - something many riders said was missing. The weather expected to gradually improve by Sunday's final. The Elite women's field has been hit hard with injuries, and a number of top riders are missing, including Myriam Nicole (France), Emilie Siegenthaler (Switzerland), Tracey Hannah (Australia) and Jill Kintner (USA). However, the top two riders of the season will be renewing their battle, with World Cup leader Rachel Atherton (Great Britain) battling defending world champion Emmeline Ragot (France) for the right to wear the rainbow stripes. Canada has some strong contenders for this physically demanding course, which suits riders such as last year's bronze medalist Claire Buchar, and former Junior bronze medalist Micayla Gatto. On the men's side there is one major name missing due to injury - defending world champion Danny Hart (Great Britain). The list of potential winners here is long, led by World Cup winner Aaron Gwin (USA), his perennial rival Greg Minnaar (South Africa), Gee Atherton (Great Britain) and Sam Hill (Australia). Hill in particular will be one to watch if it stays muddy. Canada also has a very strong podium possibility with Steve Smith, the 2010 world silver medalist. Smith is riding a new carbon Devinci, all tricked out in red and white for Canada.